Long Island’s Only Genre Film Fest will take place at the Mill River Manor Best Western Hotel, May 31 – June 2, 2013. Rockville Centre, NY - May 3rd, 2013 - TwitchTwitch Productions presents Long Island’s only film festival catering to the horror, suspense, thriller genres. The Fest will showcase independent films from around the world for the 3rd Macabre Faire Film Festival and unite filmmakers, actors, producers and horror fans under one roof for 3 days of movie madness, live band performances and Awards. At MFFF the Filmmakers are the Celebrities. The Macabre Faire Film Festival takes pride in being the FIRST and ONLY Film Festival on the Island occurring twice a year connecting with Independent Filmmakers around the globe to bring a collection of over 40 titles for every film festival. This 3rd installation of the Film Festival will be a celebration in honor of independent filmmaking regardless of the films budget. This will be the right place to meet with Long Island raised actress “Eileen Dietz” of the original “The Exorcist” film who will be in attendance all weekend to sign autographs. Along with Eileen Dietz attendees will also find one of Canada’s busiest actors “Robert Nolan” from the award winning Short film “Familiar”. Additional fine talents and directors will be sure to spend this “not to be missed weekend” on Long Island at the Best Western for MFFF. The Macabre Faire Film Festival will feature hours of independent films submitted by dozens of filmmakers for their opportunity to screen before fans and other filmmakers alike and embrace their on-screen work(s) in 3 separate screening areas. There will also be live band performances as well as a Q&A with “Eileen Dietz” along with “Robert Nolan” and more over the course of the weekend. The doors are open to everyone who would like to experience festival circuit gems coupled with that rare opportunity to speak one on one with the Filmmakers and its Actors. Attendees can obtain a more in depth understanding of the independent film industry from different perspectives. For those who are inspiring to be actors then there could be no better place than here to meet the director of what could be their first or next movie role. Special Guests on the roster include Long Island filmmakers: Philip & Robert Snyder, Dave Campfield, Sean & Christine Fitzgerald, Mike Polizzi, Victor Bonacore and Chester Indiviglio. Then you will also find guests: Eileen Dietz, Robert Nolan, Charles Lo Manto and others as well as directors: Ryan M. Andrews, Thomas Ryan, Steven Cerritos, Peter Bune, Ryan Scott Webber, Bradley Creanzo and so many more. Film titles are in abundance with those like: Youth of Today starring Eileen Dietz, Sheriff Tom vs The Zombies, Sick Boy, Cannibal Diner, Adverse Effects, SICK-Survive the Night, Dysmorphia, Ice Cream Sunday, The Devil Walks Among You starring Robert Nolan, It’s Just Like the Office, Cadence, Day 9, Scent of Rosemary while the list can go on and on with 69 titles to screen. Films are rated PG, PG-13 and R (parental guidance is suggested). The event begins on Friday, May 31 at 1pm with a Tea Party Meet & Greet until 2:30pm followed by the first film at 3pm until 1:30am. Films will begin to screen from 12pm until 12am on Saturday, June 1 and Sunday, June 2 begins to screen at 12 pm until 6pm. The day will conclude with an Awards Ceremony beginning at 7:30p to recognize the following: Best Feature, Best Short, Best Actor, Best Actress and more. Live Performances on Friday, May 31 by Will Bozarth at 8pm and Neon Knights “Dio” Tribute Band at 10:30pm. On Saturday, June 1 there will be a performance by The Wandering Cellist at 1:30pm, performance by Psyche Corporation at 4pm, performance by Vlad The Inhaler at 8pm, and performance by Demon Boy at 11pm. For more information, please visit www.MacabreFaireFilmFest.com, or contact Elsie Ginsberg at 516-395-3049 or by emailing Deathlyyours@gmail.com. 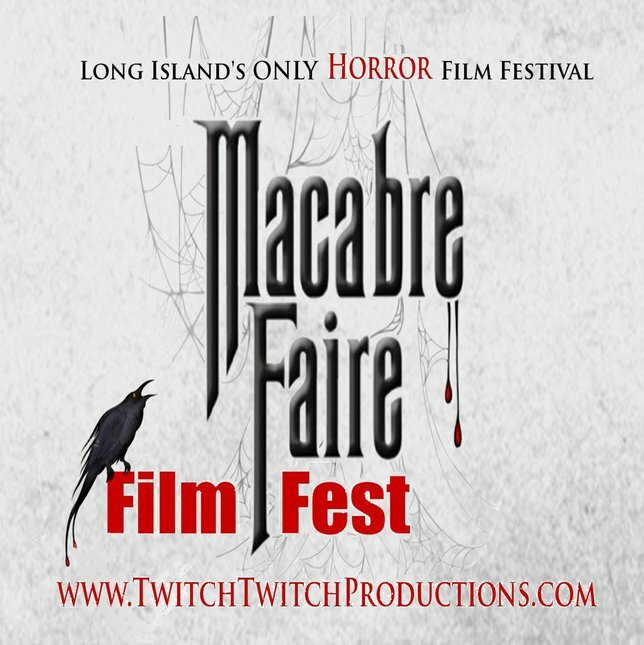 Subject: LongIsland.com - Your Name sent you Article details of "“3rd Annual Macabre Faire Film Festival” Returns to Long Island This June"